The talk of the town, Aureole's tower has raised the bar in Las Vegas for wine aficionados. Open Mon.-Sat. 5:30 p.m.-10:30 p.m.
About the restaurant: Sure enough, the wine here is the attraction. But how can you handle more than 50,000 bottles of the precious elixir? Building a tower --- 50 feet of glass and steel, storing 10,000 bottles --- was the solution of designer Adam Tihany who, upon the request of Charlie Palmer (of Aureole New York fame), created a restaurant for the century. The centerpiece of this gastronomic temple is this monument dedicated to the glory of wine. Diners watch in awe as "Wine Angel Stewards" are lifted and lowered via cables inside the tower to retrieve bottles. 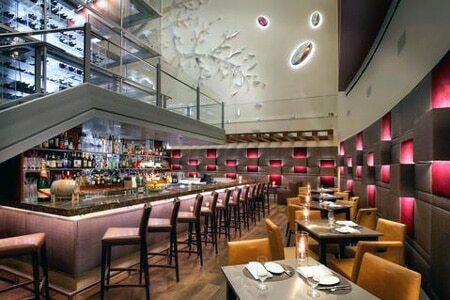 Aureole experienced a remodel and now has a new look. 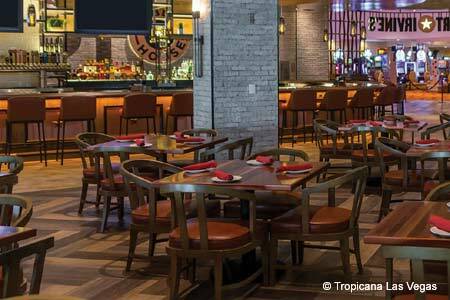 A full house of hungry patrons represents quite an undertaking for this fine dining venue, which offers a seasonal menu of great American food. About the food: Under the headings of Root, Ranch and Surf are options like raclette fondue, a selection of raw, seasonal vegetables topped with warm cheese fondue; beef and octopus carpaccio with zesty gremolata and brioche; and California crab roll rolled in fresh avocado sushi-style and sprinkled with puffed rice. Sweet endings might include cold-pressed coffee panna cotta with huckleberries, brown butter and lavender ice cream. About the wine: Wines can be paired with individual dishes, but if you wish to make your own selection, don't expect to peruse the wine list, at least not in the traditional form. An electronic slate brought to your table will, at the touch of your fingers, converse with you even if you are not wine-savvy. Those who prefer fine craft beers are not left out, with a list that incorporates Trappistes Rochefort 8, Duvel, Lindemans Cuvée Rene, Goose Island Matilda Belgian Blonde Ale and Lagunitas IPA.